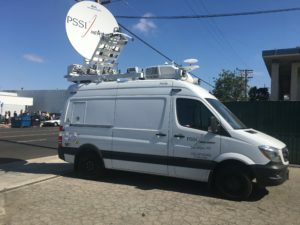 VAN NUYS, Calif. (Aug. 21, 2018) – PSSI Global Services, the industry leader in broadcast engineering and event management solutions, has collaborated with Frontline Communications to build 16 new, state-of-the-art Ku-band SNG vehicles for use by PSSI News Group in exclusive partnership with CNN. These trucks replace 16 vehicles previously owned by CNN, which — having been absorbed into the PSSI Global Services fleet — are in the process of being upgraded and will soon be available to all PSSI Global Services clients. The new PSSI News Group trucks include nine full-size Freightliner trucks and seven Mercedes Sprinters. Each is fully equipped with top-shelf broadcast equipment, including Ericsson AVP encoders and IRDs, Evertz Microsystems terminal equipment, Xenon digital routers, Hitomi MatchBox lip-sync systems, Panasonic video production switchers, and Vislink wireless RF camera systems. The new trucks are now in use by PSSI News Group engineers for CNN coverage in regions across the country, including Washington D.C., Atlanta, Chicago, Denver, San Francisco, New York City, Dallas, Columbus and Miami. The additional trucks PSSI Global Services acquired from CNN are already built for multipath news transmissions, with production switchers, extensive comms infrastructure, multichannel audio mixers, multipath encoding and decoding equipment, and more. 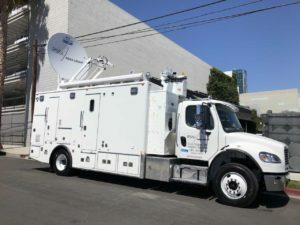 Once PSSI Global Services’ upgrades are complete, these trucks will also have advanced compression, multiplexing and IP capabilities to support sports and entertainment projects, as well as news coverage. Each truck will be outfitted with high-throughput satellite modems with dedicated satellite capacity to enable a wide range of IP services, including internet access, Voice over Internet Protocol (VoIP), enterprise connectivity, and bandwidth for backhaul and multicasting. Many of the upgraded trucks are already complete and in use, including a nimble, state-of-the-art Sprinter based in Los Angeles and several full-sized trucks with extensive production capabilities in Atlanta, Boston, Denver and Las Vegas. As the upgrades continue, PSSI Global Services plans to deploy trucks in Phoenix, Portland, Kansas City, Nashville, Charlotte and several other cities across the country, further extending the company’s already unparalleled geographical reach. PSSI Global Services’ fleet includes more than 70 uplink/production trucks based throughout North America. The company also owns and operates PSSI International Teleport. For more information, visit http://www.pssiglobal.com.